Last Friday, for the first time anyone can recall, drug-sniffing dogs were deployed at Portsmouth High School. For half an hour, students huddled in lockdown while the dogs prowled the halls. The administration has promised to continue this practice through the remainder of the year. To me, this is yet another incursion on civil liberties that is tolerated in the name of security. We've grown accustomed to NSA wiretaps, taking our shoes off at airports, and ubiquitous surveillance. 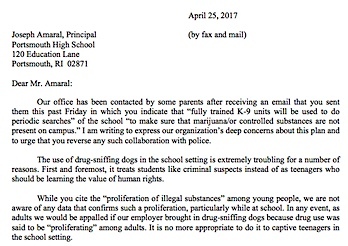 Now, we are willing to teach our children -- literally teach our children, in school -- that the state can send in dogs to sniff their belongings at any time, with no warrant. But does Portsmouth have a reason to send in the dogs? 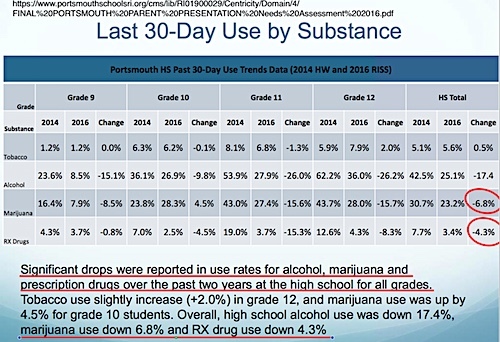 According to the 2016 Portsmouth Substance Abuse Needs Assessment survey conducted by the Portsmouth Prevention Coalition, "Significant drops were reported in use rates for alcohol, marijuana and prescription drugs over the past two years at the high school for all grades." Security versus civil liberty is an area where reasonable people and courts can (and do) disagree. Whatever position you take, I think we can agree that it affects the character of our schools and is worthy of a community discussion. The Portsmouth School Committee will be taking up this issue at their meeting on Tuesday, May 9, and I encourage parents and residents to share their views. 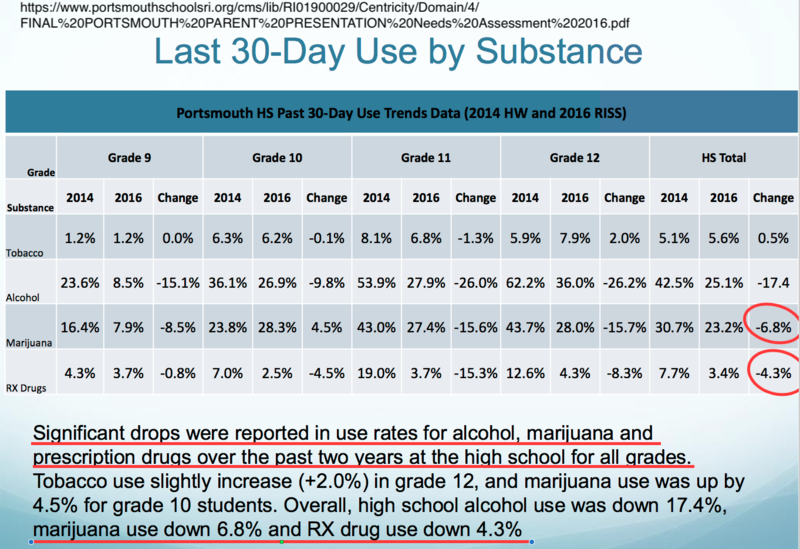 In an email dropped on a Friday afternoon during school break, buried in the fifth paragraph of what starts as an innocuous and boring memo, PHS principal Joseph Amaral announced the school would be "coordinating with the Portsmouth Police Department and other local police departments, including K-9 units, to sweep the high school to make sure that marijuana/or controlled substances are not present on campus." While the goal of maintaining a drug-free school may be laudable, I have concerns about turning our educational institution into a space patrolled by multiple police forces and K-9 units. It seems disruptive and not conducive to the environment of collaboration and trust that our Portsmouth PD had worked so hard to achieve. I can accept the notion of a school resource officer, but this feels like it goes way beyond that. Portsmouth High School consists of a community of learners who attain 21st century skills and prepare for career and college. We have the fastest growing number of students who select rigorous Advanced Placement courses while also balancing the whole student by offering a plethora of athletic and club activities for students to explore. Our students are well served with a dedicated faculty who continue their professional development in numerous curriculum areas throughout the school year as well as in the summer. Several members of our faculty have spent time engaging in professional development with students as part of Patriots Committed. This group of students and adults provide chemical free activities and ongoing substance abuse prevention and health information to our students and community in hopes of students gaining optimal performance in all that they do. Our school continues to implement a positive behavior intervention program called MTSS (Multi-Tiered Systems of Support). Our MTSS committee has organized several programs to reward students for making good choices that contribute to a positive learning community. “Pride Bucks” have been implemented as recognition, by their teachers, for students demonstrating these behaviors. Teachers also recommend students as “Students of the Month” to the Principal for a celebratory breakfast. We continue to reflect and revamp our discipline code to support a balanced approach to respect and appropriate behavior. As you may know, we have invited many organizations and groups to provide knowledge and guidance to our students on how to be safe and drug free. The State Attorney General’s program has come to our school to share with students real life stories and how we can help those who are afflicted with drug abuse. In addition, we recently hosted the F.A.C.T. program (Fostering Alternative Choices & Thinking) through the Department of Corrections for all of the Freshmen and Sophomore students in an effort to help them reflect about the best choices for themselves and how substance use/abuse will impact their life choices. We have also held assemblies and events to give students the tools to prevent bullying and intolerant behavior. This effort requires the support of the entire community including parents, teachers and students. We are concerned with the proliferation of illegal substances, such as marijuana and other controlled substances among young people. In order to maintain a substance-free high school, we are coordinating with the Portsmouth Police Department and other local police departments, including K-9 units, to sweep the high school to make sure that marijuana/or controlled substances are not present on campus. These fully trained K-9 units will be used to do periodic searches throughout the remainder of the school year. K-9 units will not engage with students. Finally, if you have concerns about your child regarding substance abuse, our Student Assistance Counselor, Kelly O’Loughlin, is available to provide additional support options. Her email contact information is oloughlink@portsmouthschoolsri.org . Working together we can make PHS an even better learning community. Former Portsmouth Sen. Chuck Levesque named "Civil libertarian of the year"
Former Sen. Chuck Levesque in 2010 file photo with Portsmouth Democratic Committee chair Len Katzman. Portsmouth's former state rep and senator, Chuck Levesque, was awarded the "Civil Libertarian of the Year" by the RI American Civil Liberties Union (RIACLU) at their annual dinner event at the Providence Biltmore last night. RIACLU Executive Director Steven Brown told harddeadlines, "For sixteen years in the House and Senate, Chuck Levesque was a passionate advocate for civil liberties. He was never afraid to tackle controversial issues in order to protect the civil rights of all Rhode Islanders." In a release describing the award, the RIACLU cited Levesque's "long-standing and firm commitment to defending civil liberties" and his legislative record: "He was a long-time cosponsor of marriage equality legislation and bills to expand the rights of domestic partners. He cosponsored the successful 2006 referendum ending the disenfranchisement of ex-felons on parole or probation, as well as a 2009 law removing mandatory minimum sentences for various drug offenses. In 2008, he was among a group of legislators and groups (including the ACLU) who countered a rising anti-immigrant tide with a package of legislation aimed at protecting the civil rights of all people in Rhode Island." “I am so grateful and honored to be recognized by the ACLU, an organization that doggedly works to defend citizens' freedoms and liberty," Levesque said in a statement. "Sometimes, fighting for civil liberties will make people stand up and cheer, but quite frequently, when you're fighting to prevent the majority from trampling on the minority, it won't make you many friends. We all owe a debt to the ACLU, and the courage and persistence of its staff and members. Whether they win praise or unpopularity, I’ve always been proud to be an ally of theirs." To learn more about the ACLU, visit their web site: www.riaclu.org. Full disclosure: I am a card-carrying member of the ACLU, and I serve with Chuck on the Portsmouth Democratic Town Committee. I am immensely proud of our former senator. Go, Chuck. Read more about Former Portsmouth Sen. Chuck Levesque named "Civil libertarian of the year"